These are so cute! btw, i love these cute bunny emoticons! aww i love the pink bunny but can you make it abit longer? i thank your very funny i reed your page every day and me and my sis thank u are very funy. Yeah, I love it too. So cute and funny, ha-ha! 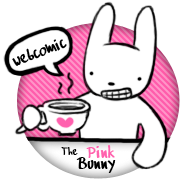 I love the Daily Pink Bunny! It is wonderful! Yay! I love it too. You are sooo funny! I love your comitchs I read them evrey day! Love it! I wish I could draw like you! Haha! I love it! It’s cute! So cute!~My little sis likes it. I LOVE THE PINKBUNNY !